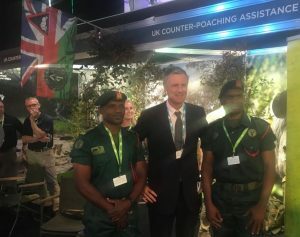 More than 70 countries were represented on day one of the conference, where the government announced £900,000 of new funding for counter-poaching training in Africa. The conference was also well-attended by charities, conservation groups and businesses. 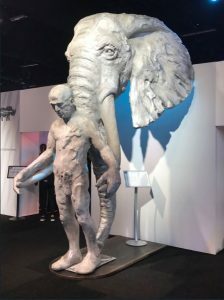 A series of initiatives were announced at the conference, including a Wildlife Financial Taskforce involving over 20 global banks that will target money laundering to trap wildlife criminals, and the Ivory Alliance 2024, which aims to have 30 more countries committed to national bans on ivory sales by that date. The UK government is also extending the training provided by its army to rangers in African nations. 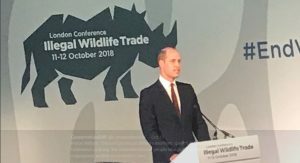 The Duke of Cambridge delivered a powerful speech at the opening session of the conference, in which he made a passionate plea for countries to devote more of their resources to tackling IWT. He urged delegates from Presidents, Ministers, Rangers and Communities to redouble efforts to end wildlife crime for the benefit of future generations. Wildlife criminals are linked to drugs and guns too. It’s heartbreaking to think that by the time my children, George, Charlotte and Louis, are in their 20s, elephants, rhinos and tigers might well be extinct in the wild. I for one am not willing to look my children in the eye and say we were the generation that let this happen on our watch. Foreign Secretary Jeremy Hunt said ” If we fail to act we will never be forgiven.” He noted that the global population had multiplied fivefold in the last century: “As we have succeeded other species have gone dramatically into decline.” He said 60% of vertebrate animals had perished in the last 50 years and that humans now far outnumbered wild animals. Ali Bongo Ondimba, president of Gabon, said: “The illegal international trade in wild animals is not just a wildlife issue, it is an issue that cripples economies, poisons and degrades ecosystems, corrupts our judiciaries, weakens our rule of law and also ruins lives. The US attorney general, Jeff Sessions, told delegates that his country’s president, Donald Trump, supported tough action on wildlife criminals: “We can’t allow the illegal extermination of entire populations of species. To the contrary, we must use our god-given resources and legal institutions to advance and defend the survival – and not the annihilation – of God’s majestic creatures.” He said the US was committing another $90m to the fight against wildlife trafficking. UN Goodwill Ambassadors Aidan Gallagher and Ellie Goulding spoke to end the illegal wildlife trade. At the evening reception, former Foreign Secretary Boris Johnson MP gave a strong speech on tackling the poachers, cracking down on illicit trade, praised the British Army, the Rangers, and talked on tackling the demand for wildlife body parts, including the pangolin. He talked on the commitments, the pledges and the work being made at the conference. On the second day of the conference, Environment Secretary Michael Gove announced the members of a new Ivory Alliance 2024 to tackle international demand for ivory. The Chinese spokesperson said that the Chinese Government has taken comprehensive efforts to tackle the illegal wildlife trade, including launching public awareness campaigns on ivory and encouraging the public to participate in wildlife conservation. Lord Hague spoke at the conference and said that reducing demand and closing markets is vital to combat the ivory trade and takes takes global effort. Former Prime Minister of New Zealand Helen Clark led a panel of First Ladies focusing on the role of women as leaders in stemming the illegal Wildlife trade. There were valuable contributions on the lessons in involving local communities, particularly women and young people. The First lady of Sierra Leone said First Ladies are not constituted but that women have the traditional way in how they communicate to a community leader. She further said women can make a difference to articulate issues to get people to listen and to change how they deal with the environment. There were calls to bring in traditional women leaders at the next conference. Minister Dr Therese Coffey talked at the Session on reducing demand for Illegal Wildlife Trade by changing consumer behaviours and said we need a change in behaviour to tackle the illegal wildlife trade crime and warned that crime in less glamorous species like Rosewood also need to be tackled. Sir John Beddington, President of ZSL chaired the panel and talked on the enormous problem of Wildlife crime and that another billion people between now and 2030 will present additional problems for tacking wildlife crime. Demand reduction is so essential as world populations are growing fast. Zac Goldsmith introduced the Innovative Finance’ How to Fund the Fight’ session of the conference where we heard examples of private sector financing of conservation and Sustainability Bonds. The panel was moderated by Alec Russell, Editor of the Financial Times, Weekend. Minister Mark Field spoke on the essential discussion with Google, Ebay and Rakuten TV all working together to ensure wildlife traffickers can no longer exploit the internet for their own sinister gain. He said the illegal Wildlife Trade has grown into a global criminal enterprise, worth up to £17bn a year – but can be fought by using big data, small satellites and forging partnerships with tech companies. The Minister also closed the excellent conference. Our Environment Secretary, Michael Gove, spoke at the opening session on the second day of the Illegal Wildlife Trade Conference. Share this video if you want to see the world come together to #EndWildlifeCrime. 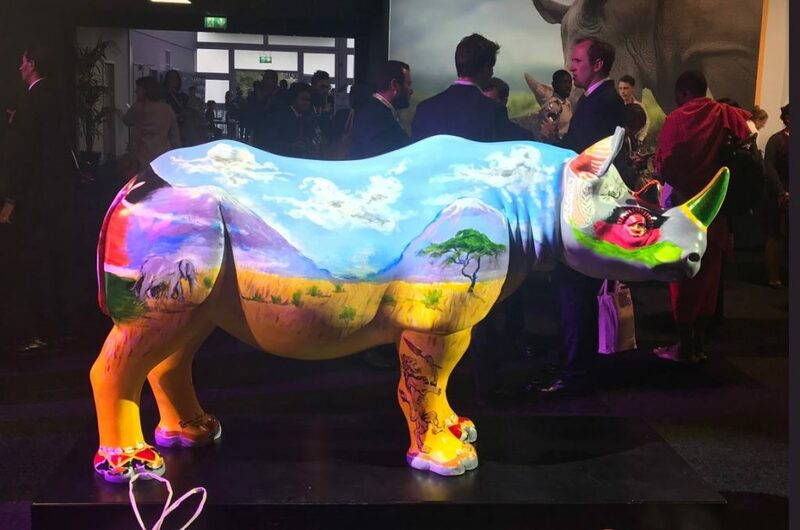 1) We, the representatives of Governments, gathered in London on 11 and 12 October 2018, recognising the significant detrimental economic, environmental, security and social impacts of the illegal trade in wildlife, make the following political commitment and call upon the international community to act together to support and build urgent collective action to tackle the illegal wildlife trade as a serious crime carried out by organised criminals, and to close markets for illegally traded wildlife. 2) In so doing, the Governments and Regional Economic Integration Organisations which have adopted the London 2014 Declaration and Kasane 2015 and Hanoi 2016 Statements on Illegal Wildlife Trade reaffirm our determination to address the illegal trade in wildlife and wildlife products and to implement the commitments made in those declarations. Those who were not participants to the original declarations now affirm our determination to combat the illegal wildlife trade in this Declaration. 3) Tackling the illegal wildlife trade remains an urgent global issue. It contributes to dramatic declines in the populations of many protected species, found across all continents, from elephants, rhinos, grey parrots and pangolins to sturgeon and rosewood, as well as increasing the number of endangered species. Demand for illegal flora and fauna products spans multiple species and market drivers, and these pressures on wildlife populations are additional to, but not limited to, other pressures such as increasing human populations, change of land-use, pollution and changing environmental conditions. The illegal wildlife trade is often a highly organised, sophisticated criminal activity that is taking place on an industrial scale. 4) The illegal wildlife trade is also a great threat to national and regional security, resulting in cross-border incursions with networks that support it often being the same as those that enable money-laundering, weapons, drugs and human trafficking including modern slavery. 5) The illegal trade in wildlife is severely impacting many species that are already threatened with extinction, as well as pushing other species into the endangered category. It fuels corruption which creates insecurity and undermines the rule of law, hampering opportunities for economic growth. Sustainable management of natural resources can contribute to the conservation of vital habitat and maintain the integrity of ecosystems, whilst engaging local communities, generating decent jobs and serving to combat the illegal wildlife trade. 6) Organised crime, corruption and associated illicit financial flows related to the illegal wildlife trade take resources away from government revenues. 7) It is important to highlight the impact of the illegal wildlife trade on the sustainable livelihoods of communities, and the importance of countries’ obligations to uphold agreements made with indigenous and local communities. 8) Tackling illegal wildlife crime and associated anti-poaching activities have a considerable cost implication forcing governments to commit limited funding away from conservation activities. 9) The illegal wildlife trade, too often seen only as an environmental issue, is conducted on an industrial and transnational scale, in many cases for high profit. To tackle these serious transnational crimes, we need to deploy the full range of public and private tools, legal frameworks and responses developed to tackle other transnational organised crimes, which has been accepted by the CITES Conference of the Parties and the UNGA resolutions. While such responses are being deployed, they would benefit from a more systematic implementation on a wider scale. Further reducing barriers to law enforcement collaboration, both internationally and within countries, is vital to ensure we deploy the full range of tools and techniques for combating serious and organised crime. 10) We will increase action to tackle the illicit financial flows associated with wildlife trafficking and related corruption, including the increase of use of financial investigation techniques and public/private collaboration to identify criminals and their networks. 11) We welcome action taken, in accordance with domestic law, as appropriate, to treat wildlife offences as predicate offences, including for money laundering crimes, as defined in the UN Convention against Transnational Organised Crime. We will also make strong use of the UN Convention against Corruption to prevent and combat corruption related to the illegal wildlife trade and wildlife trafficking. 12) We will take action to strengthen anti-corruption and money-laundering activities and, where relevant, legislation as it relates to wildlife trafficking offences, including raising awareness among relevant criminal justice system professionals on the seriousness, impact and potential profits of wildlife crime. We will endeavour to share experiences and best practice in this area. 13) By addressing local livelihoods, including generating decent jobs, people will have alternative and sustainable ways to support themselves and, in some case, benefit directly from wildlife. We will work to support sustainable livelihoods which provide an alternative to engagement in the illegal wildlife trade. We recognise the essential engagement role and rights of local communities and indigenous people to ensure a sustainable solution to addressing the illegal wildlife trade. We also recognise the importance of local communities acknowledging the value of protected species and habitats, and the benefit this value can bring. 14) We recognise the importance of capacity building for wildlife management departments. We welcome the efforts made by countries in tackling the illegal wildlife trade, such as establishing enforcement coordination mechanisms, closing domestic ivory markets where they contribute to poaching and the illegal trade, providing equipment and training for developing countries and joint international enforcement operations. 15) We recognise the need for involvement and action of Government Ministries and agencies as well as sub-national authorities beyond those focused on the environment or nature conservation in order to address the systemic and criminal factors facilitating and benefitting from the illegal wildlife trade. 16) We recognise that international cooperation is essential, with full engagement by Governments in relevant bilateral, regional and international mechanisms. Through engagement with local communities, the private sector, NGOs and academia, as well as bringing in new partners, we will build and strengthen sustainable, long-term partnerships to change incentives for those involved in the illegal wildlife trade. We will harness technology and share and scale-up successful and innovative solutions. 17) We welcome the commitments by countries and others to working to combat international wildlife trafficking in collaboration with local communities to ensure sustainable livelihoods. It is critical to focus on well-managed places in source countries where the relationships with local communities can be nurtured over time. 18) We also welcome increased cross-border source, transit, and destination country cooperation and other activities to address the illegal wildlife trade including through bilateral, regional and multilateral agreements and mechanisms, whilst facilitating the regulated, sustainable and legitimate use of the natural resources we all depend upon. 19) We recognise the need to address demand for illegal wildlife products. Until now, the resource and effort spent globally on reducing demand for illegally traded wildlife and wildlife products has been small in comparison to other types of intervention. 20) To end the illegal wildlife trade, it is imperative that any steps taken to tackle the demand for these products are based on evidence and built on best practice. We recognise the importance of research to understand market drivers so that effectiveness can be increased. We also recognise the need to tailor research to the specific drivers of illegal use of a species or product. Similarly, we recognise the need for greater investment in tools, data analysis and funding. We welcome steps taken by countries and organisations to understand and target specific drivers in demand reduction campaigns and commit to learning from these examples, sharing best practice and evaluating impact. We recognise the powerful impact of government-led behaviour change campaigns, and welcome efforts by countries to increase these campaigns in order to reduce demand for illegally traded wildlife and wildlife products.